The new iPad is already available in the US, Australia, Canada, France, Germany, Hong Kong, Japan, Puerto Rico, Singapore, Switzerland, UK and the US Virgin Islands and will be available in 24 more countries starting at 8:00 a.m. local time on Friday, March 23 through the Apple Online Store (www.apple.com), Apple’s retail stores and select Apple Authorized Resellers, including Austria, Belgium, Bulgaria, Czech Republic, Denmark, Finland, Greece, Hungary, Iceland, Ireland, Italy, Liechtenstein, Luxembourg, Macau, Mexico, The Netherlands, New Zealand, Norway, Poland, Portugal, Romania, Slovakia, Slovenia, Spain and Sweden. The new iPad Wi-Fi models are available in black or white for a suggested retail price of $499 (US) for the 16GB model, $599 (US) for the 32GB model, $699 (US) for the 64GB model. iPad Wi-Fi + 4G for either AT&T or Verizon is available for a suggested retail price of $629 (US) for the 16GB model, $729 (US) for the 32GB model and $829 (US) for the 64GB model. iPad is sold in the US through the Apple Online Store (www.apple.com), Apple’s retail stores and select Apple Authorized Resellers. Additionally, the incredible iPad 2 is now offered at a more affordable price of $399 (US) for the 16GB Wi-Fi model and just $529 (US) for the 16GB Wi-Fi + 3G model. **4G LTE is supported only on AT&T and Verizon networks in the U.S. and on Bell, Rogers, and Telus networks in Canada. Data plans sold separately. 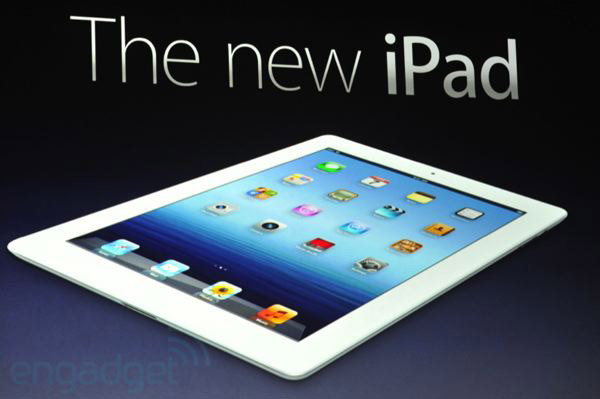 Previous Post Apple – The new iPad – It’s brilliant from the outside in.